I was introduced to Sisely this year and it was literally love at first use. For about a year, I have seen Sisley products online and the curiosity since lingered. I do have a soft spot for luxury brands and if I were ever to exit the blogging world, Sisley would be one of the few brands I would continue to use. It is such an under-rated luxurious brand of the utmost quality that deserves more attention. I have been trying a few pieces from Sisley for quite a while now I am finally confident to provide my verdict! Floral cream formula is rich in trace elements, vitamins and anti-aging active ingredients to provide theskin with a beauty boost in 10-15mins. Packaging: The mask comes in a plastic squeezable tube bottle allowing product to be dispensed with ease. Scent: A beautiful rose scent that is not over powering or pungent. Texture: A creamy gel like formula that glides over my skin allowing the mask to be easily spread. A little goes a long way with this mask! What Happened after 10 mins? If I am in a hurry, I'd leave this mask on for 5mins, otherwise I will leave it on for a good 10-15mins - and no, you will not experience any irritations or burns to the skin like I have with some of the other masks. My skin felt ridiculously plump and hydrated after use. When I filmed the video below, it was "that time of the month", I was going through my bad skin days and foundation just looked awful on my skin. This product did such an amazing job, it really hydrated my skin to the point where my pores actually looked smaller and foundation sat on my skin like a dream. I know I should be wearing moisturiser on top but on hot evenings, I feel that this mask is enough. Final Words: Fiona from Star PR highly recommended this product to me, it's one of those products where you won't know how good it is until you've tried it. I highly recommend this mask. Contains botanical ingredients such as Gingko, extract of Arnica, extract of Mallow and extract of Linden. Gel formula that will leave a soft imperceptible film that will continue to work after the mask is removed. 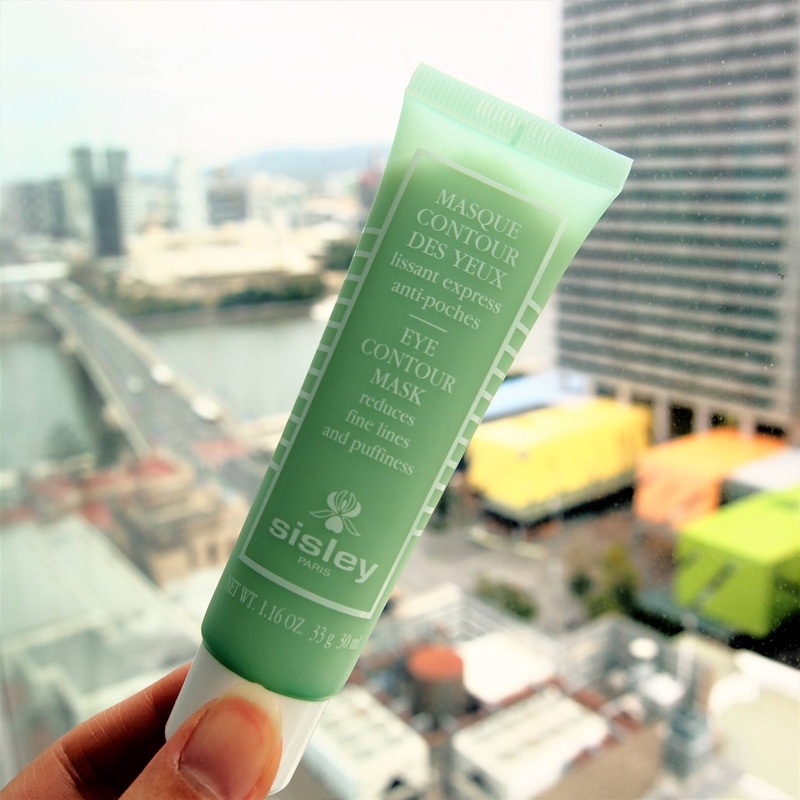 Packaging: Similar to the mask, the eye contour sits in a plastic squeeze tube where product can be dispensed with ease. Texture: A gel formula where once applied, it actually does feel like a gel mask. Super duper hydrating! Did it work? It did, whilst it did not work like some of the under eye products I've seen on infomercial (where under eye lines, bags and dark circles are temporarily erased within 2-3mins) but it did assist in minimising the size of my under eye bags and made my under eye dark circles less noticeable. It won't make anything go away but it will awaken tired under eye areas. I took this product to Brisbane where I camped out and had literally no sleep - this eye contour was an absolute life saver. Final Words: The bags, dark circles and puffiness under my eyes are my biggest concerns yet, and if you are like me, then this product is a worthy investment. Can you see how smooth and plump my under eyes look in my video?? Especially in the close up, it's insane! Packaging: A very unique roller ball with pump action dispensing. I find that I often dispense a little too much and it's more than what I need for my spots. Problem Areas: I actually have a bit of freckles on my nose and cheeks. Every time I rid some more will come back in a matter of weeks. I enjoy the sun and doesn't matter how much SPF I use, I continue to get freckles. Texture: A cream-gel formula that is easily absorbed by the skin. I like to apply the content with the rollerball and tap the formula into my skin with my fingers. Does it work? I noticed some very minor fading to the spots on my nose, but I am in the sun most days (I can't help that I love the sun!) and hence freckles keep coming back. Final Words: To be honest, this is a product I am on the fence about. I say this every time, but it is impossible for me to love every product I try and there will almost always be a product in my reviewed lot that just wasn't suitable for me, and unfortunately this dark spot corrector is one of those. Nonetheless, what doesn't work out for me doesn't mean it won't work for others, I have actually given the dark spot corrector to my mum (she doesn't go out in the sun too much and have many spots to erase). Packaging: The palette comes in a square plastic container with a magnetised opening! It took some getting use to for me as I am so accustomed to click in palettes. Once I learned to always open this palette by gripping onto the sides it became much easier. To be honest, I didn't mind it, but mum preferred a clickable case. The palette comes with a dual ended sponge tip brush, a wider flatter side for base colours and a smaller tip for the darker shades. Texture: This is a gel to powder formula which is why I don't really experience much fall out. The formula is pigmented, non-streaky and easy to blend/apply. The Shades: The Dream Palette is a luminous palette, suitable for those who enjoys a little shimmer on the lids (ME!!!!). These however are not large sparkles or aggressive glitters, they are subtle shimmers that glimmers softly under the light. Even though the darkest shade contains shimmer, it can easily be used as a liner as the shimmer is not as noticeable. If you are a mattes only gal or guy, this may not be the most suitable palette for you. I should also note that the lightest shade Pearl Beige makes a beautiful highlighter. Longevity: Wear time is approximately 6 hours before some noticeable fading. I think due to the formula this eyeshadow doesn't really crease like other shadows- something that I personally prefer. Finger VS Brush: If I am in a rush, I would use my finger and it does a fine job, if I have time I would use the sponge tip provided. I would not recommend using a brush as I find that the brush is unable to pick up the same amount of product as I would with my fingers or sponge tip. Final Comment: I personally love using this eyeshadow quad for everyday use as I personally prefer shadows with a slight shimmer over pure mattes, most of the time. Available in 3 shades: Petal (rosy hue), Fuschia (vibrant pink) and Papaya (featured in the photo above). Packaging: Comes in a plastic tube with beautiful zebra stripes, the tube is easy to twist allowing excellent twisting control. Although no click in mechanism (for the lid), the lid of the tube can be closed tightly. Texture: Extremely smooth and creamy, it will glide on the surface of your skin. Once applied, there is no urgency to blend the product like some of the other cream blushes I have used. This cream blush is ultra blendable and will not leave any streaks nor will it ruin your foundation. I promise you that it will provide the most beautiful peachy glow to my cheeks. When I don't have a lip colour, I often use this product on my lips, but because once it settles it's quite matte, I would use a lip balm over or under. Fingers VS Brush: I highly recommend you to use this product straight from the tube and blend it with your fingers. Longevity: It lasted for approximately 6-7 hours on me, this product doesn't wipe off your face like your conventional powder blushes would. I would often notice finger marks on my face (because I tend to palm the side of my face fairly frequently), I didn't really notice any finger marks after using Phyto Blush, rather I noted some fading but there is still a hint of coral. How Much Product Do I Get? You will receive 5.5g or 0.19 ounces, this may be the only con to this beautiful blush - I wish it was never ending. Final Comment: This is probably the best cream blush I have used so far. With a lot of the other cream blushes it was either a rush against time to ensure the product is blended before it dries or becomes streaky. When I first say this blush I instantly thought "No, it's too bright", if you watch my video below you will see that it blends beautifully. If you are looking for a high quality cream blush - check out Sisley's Phyto-Twist. A fragrance that speaks to all generations of women. Isabelle brought 5 women together to make this fragrance, Armandine Clerc Marie (The Perfumer), Quentin Jones (The Artist), Sonia (The Muse), Isabelle and Christine d'Ornano (Sisley). Heart Note: Rose Accord enhanced with refreshing notes of pear, fresh petals of jasmine with peony and lily of the valley. Green angelica adds a powdery nuance. Base Note: Rose accord highlighted by powdery musk, woody warmth of cedar and amber. This fragrance is just gorgeous inside and out. I can't even begin to express how beautifully elegant the bottle is, it's a work of art on it's own and perfect for your dressing table. The fragrance itself is a refreshing rose scent - I know a lot of people think grandma products when they see rose scents, but Izia is in-between youthful and sophistication..... I can definitely see how this fragrance can be worn by men and women of all ages. I usually use 3 spritz, the nozzle will dispense nice fine sprays of perfume with a wide coverage. The beautiful scent will linger for the entire day. A very soft smokey look. I swear my face and body are the same colour, it's the weird lighting! I loveee Sisley at the moment! That mask sounds amazing, I'll have to try that next! The Dream palette is perfect to have for the New Year's eve!